Achieve a fit physique with the 50-lb. Kettlebell Weight Set from Marcy! Specifically designed to take your training to the next level, this premium workout weights boast an ergonomic construction that makes it ideal for circuit training and home exercise. This set comes with four kettlebells, making it perfect for everyday use for both beginners and fitness gurus! These fitness kettlebells come in a larger size for better handling. The rubber coating offers a solid grip that won’t slip even when it’s wet with sweat, unlike traditional steel weights that are prone to rust and slippage. This set includes four weights: 5, 10, 15, and 20 pounds. Each offers different levels of difficulty and intensity, allowing you to widen your options. Additionally, kettlebells have a versatile design that can target distinct major muscle groups with varying sets of exercises. Perform squats, rows, lifts, swings, and more without needing bulky and complicated machinery. The handles are reinforced with a powder coating. Designed to protect your home gym’s floor if they are accidentally dropped, the kettle weights are furnished with a rubber coating to avoid damages. Use these kettlebells in your home gym for excruciating yet satisfying workouts that will truly enhance your body. Use this reliable equipment for your circuit training or as an accessory to the Olympic weight bench set for intense workouts that will help you get in your best shape. Get the Marcy VKBS-50 50lb. Kettlebell Weight Set and enjoy the benefits of an intense workout without having to leave your home! 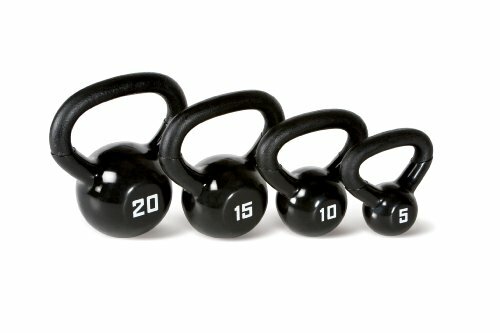 WEIGHT VARIETY - Modify your workout patterns with this kettlebell set that includes four different weights: 5, 10, 15, and 20 pounds. These weights are ideal for both beginners and long-time gym-goers that are looking for intense muscle building. HANDY EXERCISE CHART - Strengthen and develop different muscle groups with this premium weight set! The package comes with a handy exercise chart that will walk you through a variety of routines that efficiently target different muscle groups. IDEAL FOR CIRCUIT TRAINING - Enjoy working out right in the relaxed environment of your home with this functional gym equipment! These weights are an excellent use for body conditioning and resistance training using high-intensity aerobics. Kettle Gryp Kettlebell Adjustable Portable Weight Grip Travel Workout Equipment Gear for Gym Bag, Crossfit WOD, Weightlifting, Bodybuilding, Lose Weight | Clamps to Dumbells | Made in U.S.A.
TDS Kettlebell - 175 Lb.